The project was for the transformation of a sun-scorched internal courtyard into a collective and pleasant experience for office workers. Establish the possibilities of the existing space. Complete the facilities with adhoc furnishings. It needed to invite users to feel it, to enjoy the freshness of the vegetation and had to adjust to the scale of its surroundings. We arranged the linear benches towards the concrete wall. We built a lightweight pergola to accommodate climbing plants. We completed the picnic zone with new wooden tables and colourful seating. 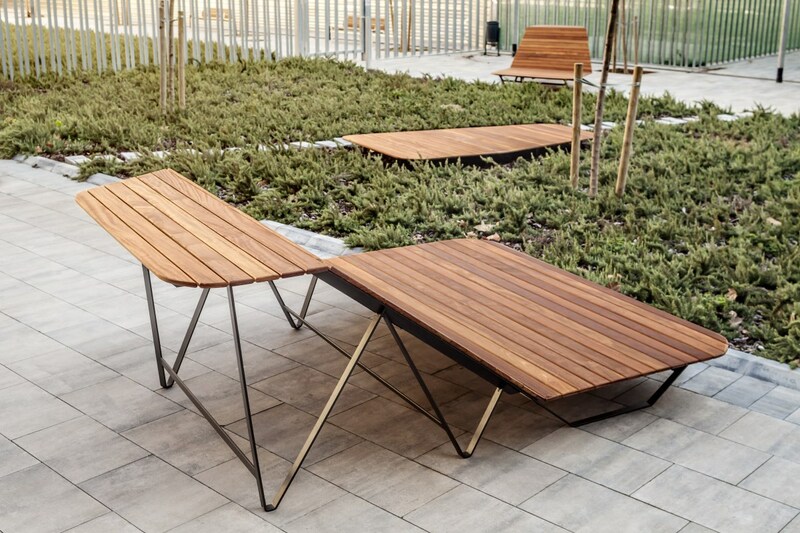 We installed a drip system into the central garden space and incorporated four wooden platforms that allow people to enjoy the nearby presence of rosmary plants and offer the possibility of holding small informal meetings. In one corner a large outdoor table sheltered by a second lightweight pergola with climbing plants offers a space for informal work meetings. The courtyard was already a potentially attractive space, but lacked freshness and greenery. It is an open space, protected from the noise of the street, which provides the access to the office entrances. The jacarandas, benches and other elements of furniture were organized around a rectangular bed of aromatic plants. The result was a space that appeared empty, not particularly inviting and lacked character. Our proposal was to insert simple and comfortable elements into the courtyard, enhancing the latent sensations that the space offers. Only three craftsmen were used: a gardener, metalsmith and carpenter. The project was implemented in three weeks. 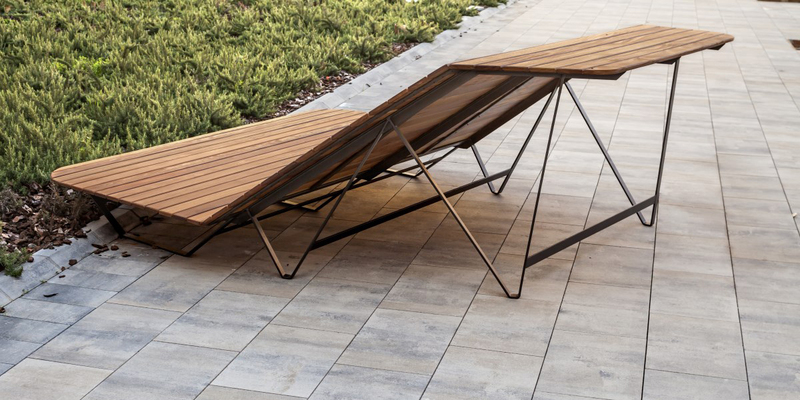 The tables and platforms contrast with the rigid geometry of the courtyard. They are arranged in the shade of the pergolas and adjoin the bed of aromatic plants. A set of stackable, weather-resistant and ergonomic chairs lend colour and variety to the floor. The existing vegetation is complemented with low-maintenance climbing plants.